When I moved to Lambton and read through the Newcastle Family History Society’s “The Story of Lambton”, I was intrigued by the photos of a picnic destination variously described as “Nellie’s Glen”, “Glen Lewis”, or “Paddy Lewis Dam”, and I wondered where this beautiful spot was. The location appeared idyllic enough that it even featured on a postcard in the early 1900s. I set myself the challenge of finding “Paddy Lewis”, and recently, after assistance from some old maps, Google Earth and the National Museum of Australia, I was able to confirm the location of this picturesque site. Postcard of “Glen Lewis, Lambton” from the Gaston Renard collection in the National Museum of Australia. But pictures can be deceptive, for this is no ordinary bushland setting, but an industrial scene. That’s not a picnic shelter in the background, but an engine house of the Lambton colliery, with a boiler and steam driven winding engine used to pull steel cables that went down a shaft into the mine to haul coal skips from distant parts of the underground workings. The engine, for reasons now unknown, was called “Paddy Lewis” and the dam in the foreground supplied water to the steam boiler. The engine was first erected in 1878 under the supervision of Thomas Croudace, the manager of Lambton colliery. In 1904 a fire in the middle of the night destroyed the engine and it had to be replaced. The engine operated up until 1921 when all the payable coal had been extracted from the western portions of the mine, and the engine house was then dismantled. 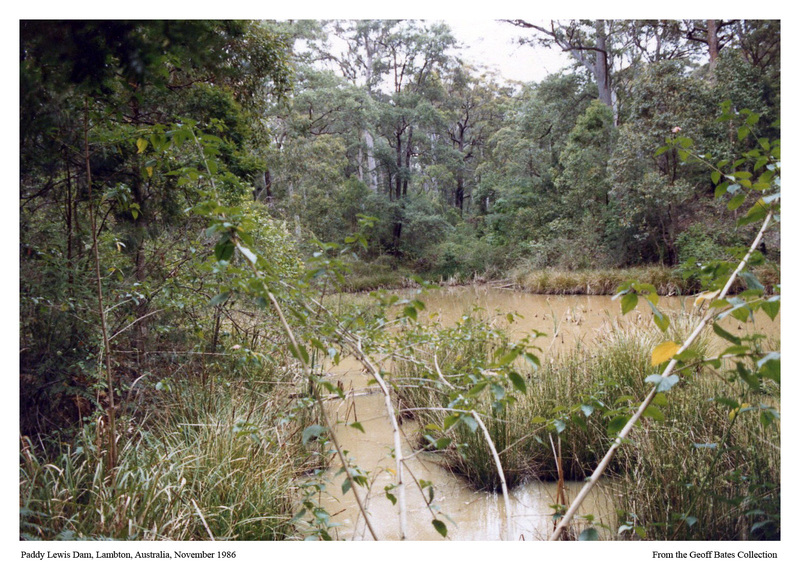 Paddy Lewis dam is still there today, nestled in a gully in the bushland below John Hunter Hospital, but now overgrown with reeds and vegetation. Nothing remains of the engine house apart from a few fragments of brick foundations, this industrial scene having now returned to an ordinary bushland setting. Long since overgrown with vegetation, the site of the Paddy Lewis dam can be found in bushland below John Hunter Hospital. The article above was published in the July 2015 edition of the Lambton Local. My quest to confirm the location of Nellie’s Glen/Paddy Lewis dam took about six months, and a significant contributor in that quest was Robert Watson. Shortly after I moved to the area and read “The Story of Lambton” I wanted to find this location. A short time later I met Robert for the very first time, and towards the end of a wide ranging discussion about local history, and without him knowing that I was already interested, he said to me “I’ve got a challenge for you – to find the location of Nellie’s Glen/Paddy Lewis dam!” Thus began a six month quest, with each of us sharing information, ideas, theories, suggestions, encouragement and inspiration. 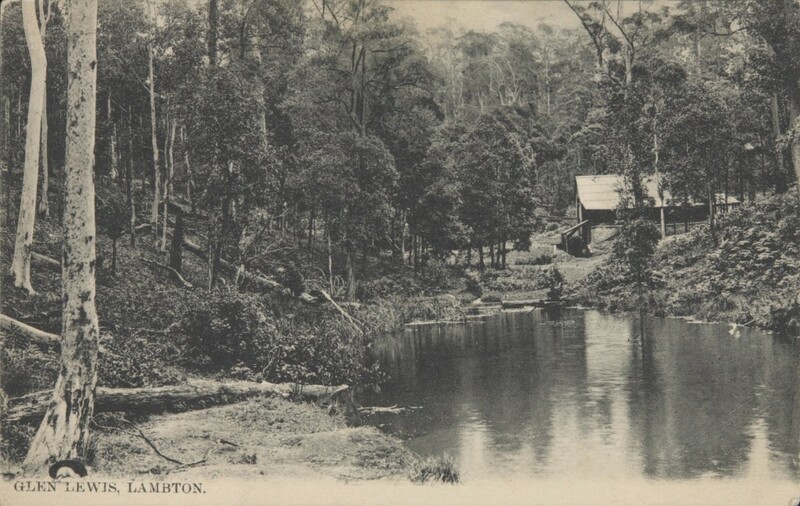 As well as the photo in “The Story of Lambton”, the University of Newcastle Cultural Collections image archive also had a picture of this location, captioned as “‘Nelly’s Glen’ [& Paddy Lewis Dam], Lambton”. It took a while before I realised that the two images, while very similar, were not the same. Note in the photos below how the reflections in the water are different. As an interesting exercise for the reader, see what other differences you can spot, then try to work out which photo was taken earlier than the other. 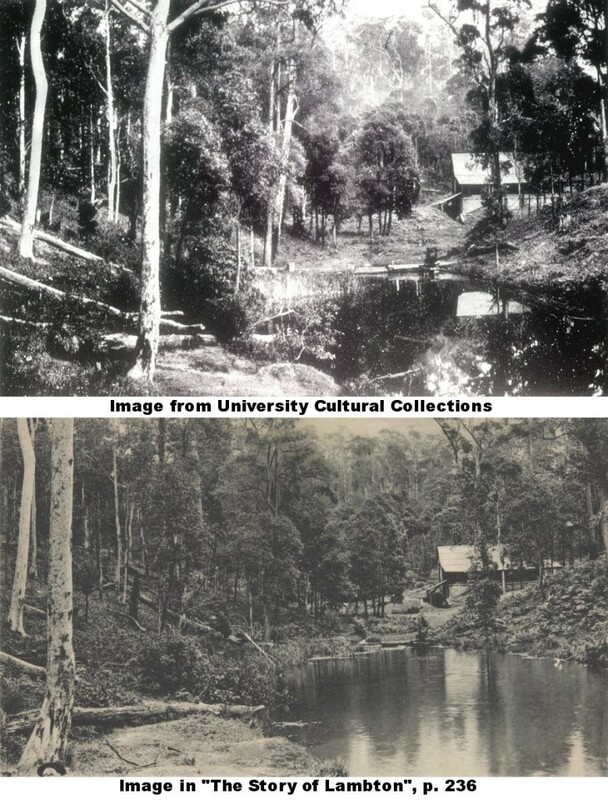 I subsequently found that the lower image was used in a postcard in the early 1900’s, a copy of which was held by the National Museum of Australia, who kindly obtained a good quality scan of the postcard for me. 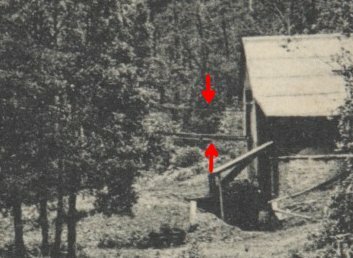 Quite early in my search for this location, in February 2015, based on information in a 17 Nov 1904 newspaper article about a fire at the Paddy Lewis engine house, I made an educated guess about the location of the dam. 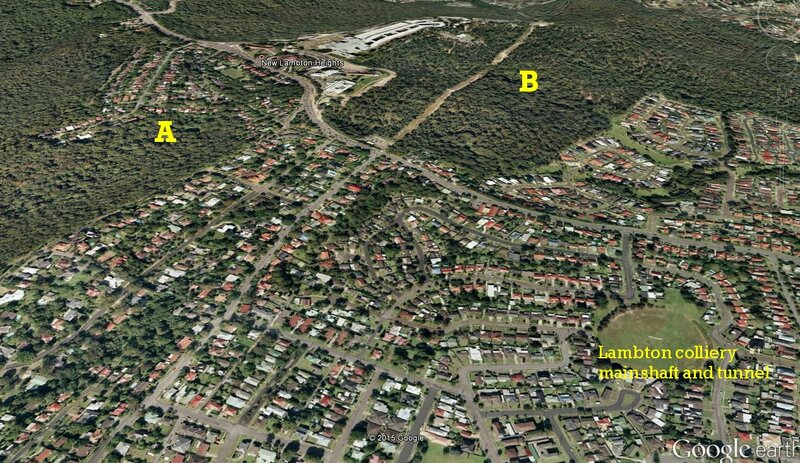 The image above is from an email I sent on 7th February 2015, where I suggested that the area marked B was possibly the location of Paddy Lewis dam. I visited the location on 13th March 2015 and took the photo below, and found it to be a quite plausible location, but could find no evidence of any buildings, and nothing to confirm my suspicion. 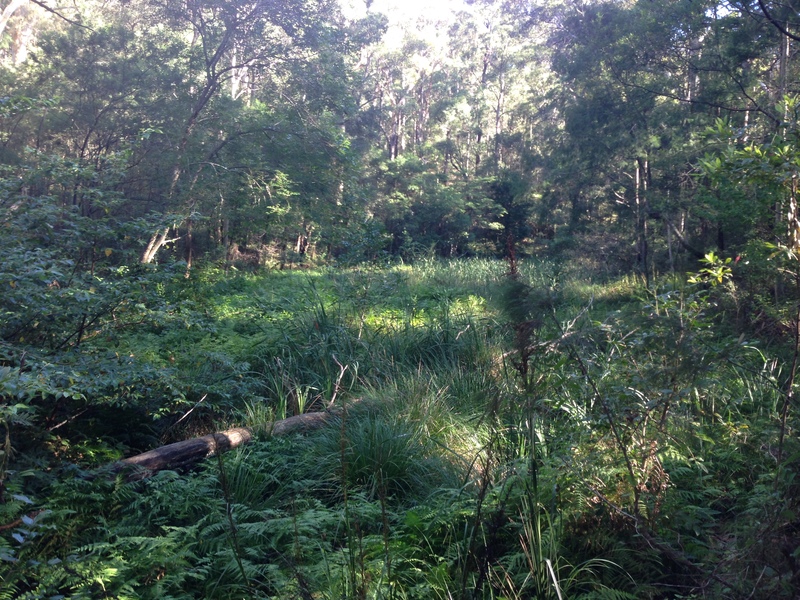 Over the next few months I walked to quite a few locations in the Jesmond bushland and in Blackbutt Reserve, and found a few other plausible locations, but in so doing began to wonder if I would ever confirm the location, as I found that each shallow depression in a gully in the bush looks like every other shallow depression in a gully in the bush! Robert Watson then provided two key pieces of information. Firstly, some recollections told to him by an old Lambtonian giving directions of how he used to walk to “Paddy Lewis Dam”, and secondly a scan of a portion of an old Craigie’s map that showed a dam, an engine house and shaft. This matched my suspected location, and also on noting that the engine house and shaft were on opposite sides of the gully, inspecting the photo more closely I noticed the hint of cables exiting the building and crossing the gully, which matched the map. I was able to take the image of the old map and load it into Google Earth as an overlay, and stretch and rotate the image to align it with modern features. After doing this I could determine the latitude/longitude of the various features such as the engine house and shaft. I found some fragmentary remains of the engine house, and the remains of the old winding shaft. I recorded the exact GPS coordinates of the shaft, and when I got home compared it with the predicted location based on my overlaying the old map into Google Earth. 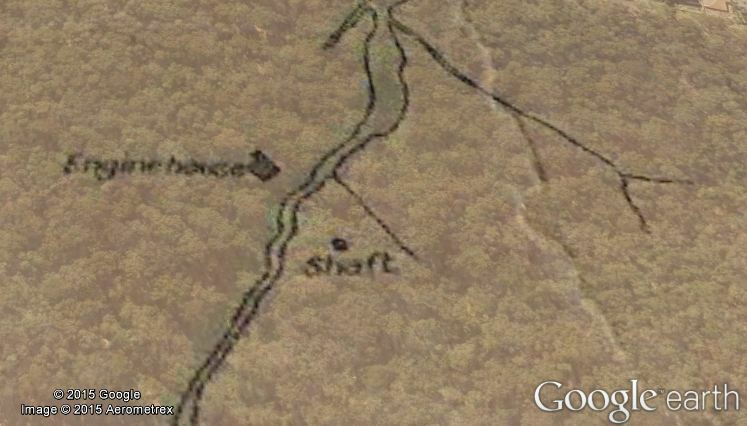 The difference was only 23 metres – a testament to the accuracy of the old map makers and the power of Google Earth. 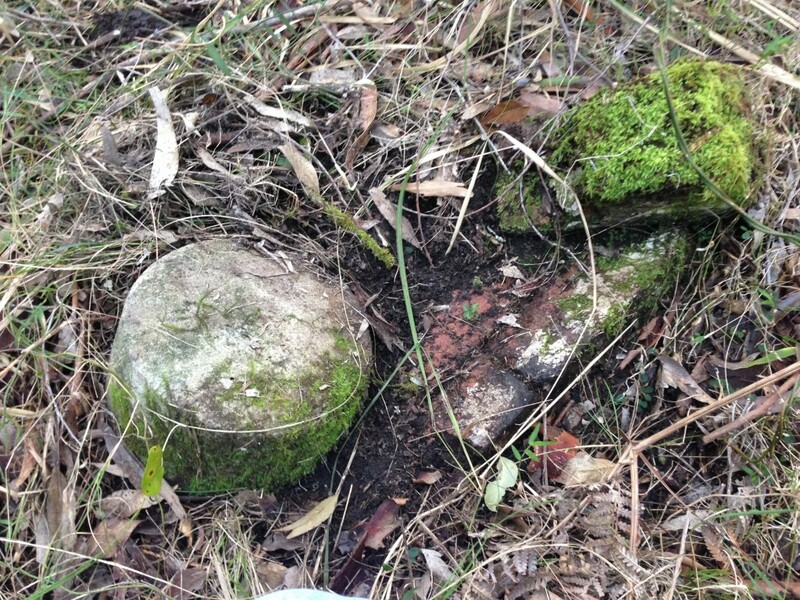 Some fragmentary remains from the Paddy Lewis engine house. Remains of the Paddy Lewis winding shaft. The sides have caved in and fallen down the shaft, leaving a large depression in the ground about 10 metres across and 3 metres deep. Danger. If you encounter this old shaft – do not enter this depression. The shaft was last used in 1921, and 94 years of erosion has probably blocked up the shaft, but it is possibly still deadly. Based on the depth of the coal seam and the ground altitude of this location I estimate the shaft was originally about 50 metres deep, and you do not want to find out by accident exactly how deep it was. 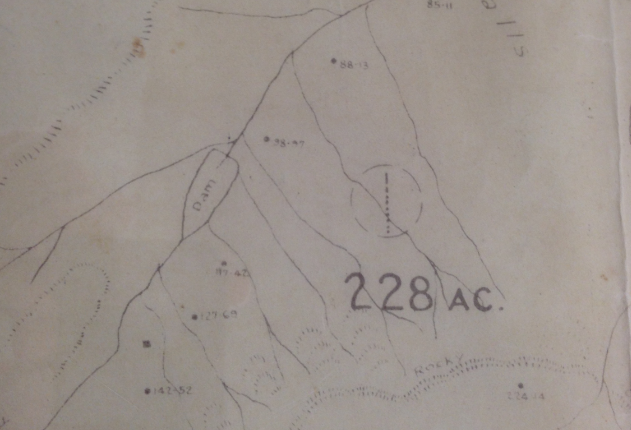 As well as the Craigie’s map that showed the dam, engine house and shaft, I found in Newcastle Library’s Local Studies section an old map from the Scottish Australian Mining Company from 1925, that shows the dam and shaft (little black square), but no engine house, as it was dismantled in 1921. 1925 Scottish Australian Mining Company map. Newcastle Library ref 622.33/25 MAPC. 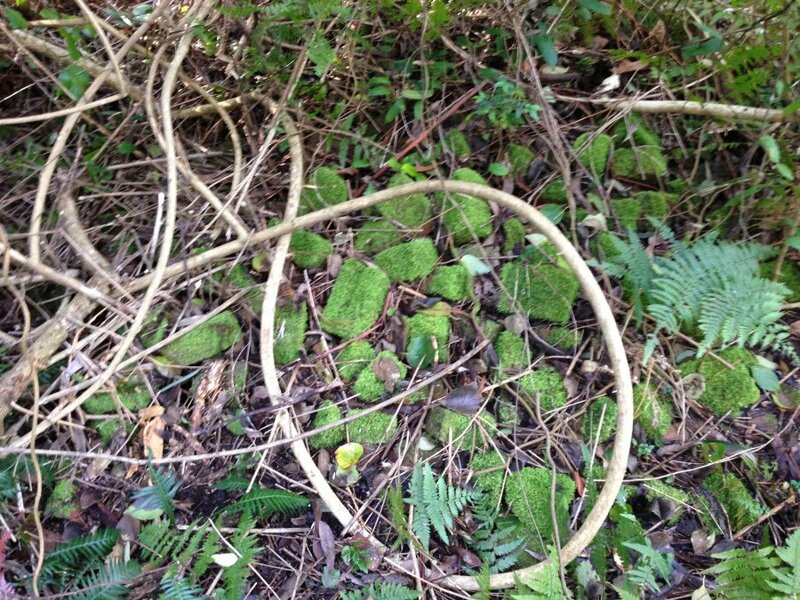 In July 2015 I revisited the site with some friends, and this time ventured into and under the lantana growth towards the bottom of the gully, and found substantial remains of the brick foundations of the engine house – numerous piles of moss covered bricks. 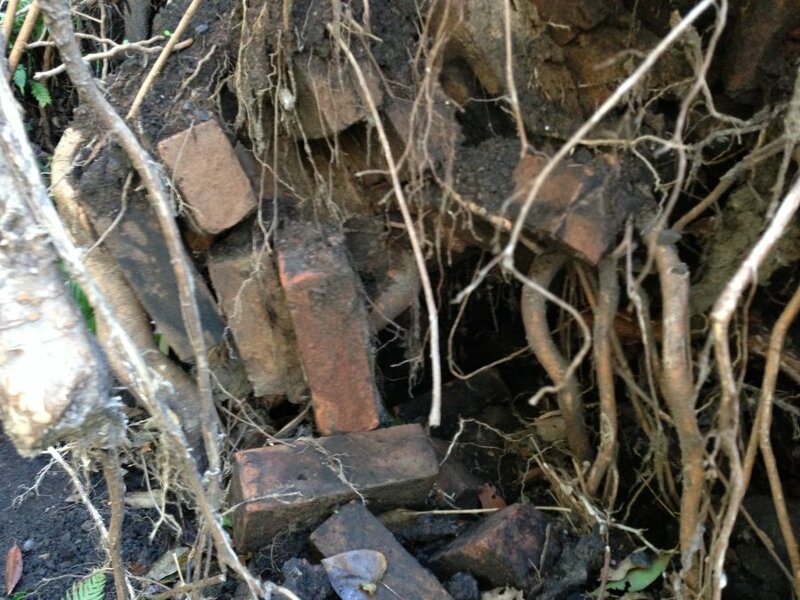 At one place, a large tree had grown over the foundations, and when it toppled over fairly recently, it has pulled up and exposed bricks that were previously under the ground. Geoff Bates, who used to visit Paddy Lewis dam in his youth revisited the site in 1986 and took a couple of photos. 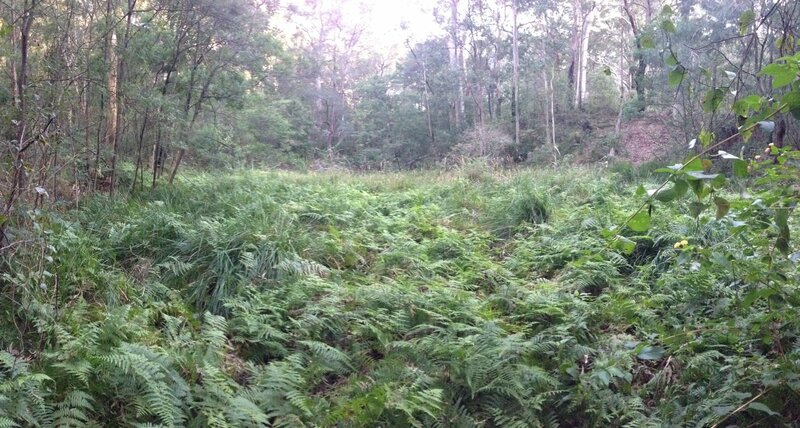 It is interesting to note how in the last 30 years the dam has become completely overgrown with vegetation. Geoff recalled that in 1986 he had to pick and choose where to photograph because of the old car bodies that had been dumped in the water of the dam. On a visit to Paddy Lewis in December 2018. 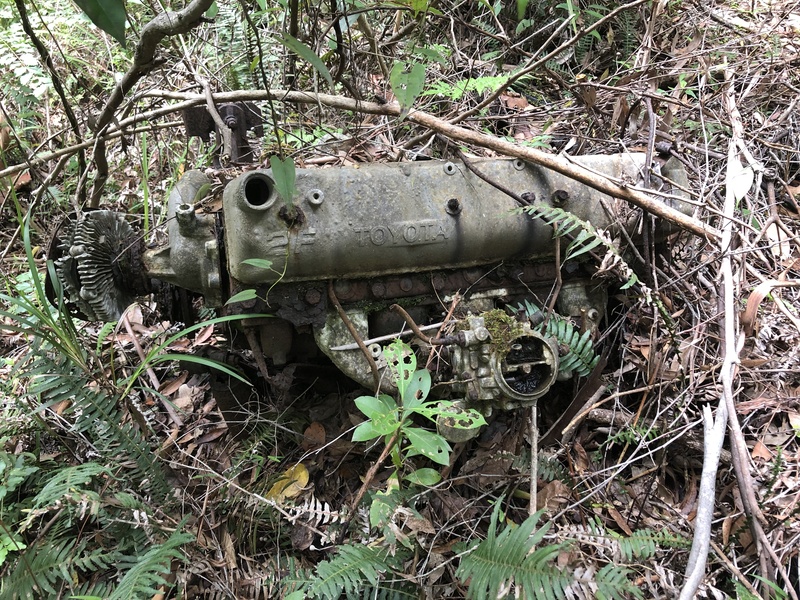 I found the remains of a car engine in the bush. Remains of a car engine near Paddy Lewis Dam in December 2018. 2 May 1876 "For some time past a number of men have been employed by Mr. Croudace, Manager of the Lambton Colliery, excavating for the purpose of making a reservoir, in the bed of a creek, about half a mile from the pit, where it is proposed to erect an engine for the purpose of hauling the loaded skips from a portion of the dip workings." 16 Nov 1904 Fire at the engine house known as Paddy Lewis’s. 30 May 1921 Dismantling the hauling engine known as Paddy Lewis in the western portion of the estate. 14 Jul 1951 Story of how a murder victim was thrown down a disused mine shaft in Jesmond. Allan Kemlo tells me that it wasn’t the Paddy Lewis shaft, but it shows the nefarious purposes that some of these old shafts were used for! I am reasonably convinced that the information, photos, maps, and locations described above refer to “Paddy Lewis Dam” which was also known as “Glen Lewis”. There is some evidence to suggest that this location was also known by the name of “Nellie’s Glen” or “Nelly’s Glen”. However, there are some old newspaper articles, which suggest to me that there is another different location, in New Lambton, which was known as Nellie’s Glen. These articles refer to a location that also had a winding engine, but this engine was called “Die Davies”, and was dismantled in 1925. 10 Feb 1912 – Sale of orchard and house in Nellie’s Glen, New Lambton. I would welcome any information anyone has regarding this Nellie’s Glen and the engine that was once there. related to the shed. I have vague recollections of old railway sleepers along the track which formed undulations which we used to ride pushbikes over. There’s trails of coal all the way along track towards new lambton gardens. I can see that on the left hand side of the shed (which is actually on the east, as the photo is towards the south) it looks a little bit like a drive going into the hill. However based on the information I have I don’t believe it is a drive. Firstly none of the maps or newspaper articles refer to a drive, and secondly, if I have correctly identified the location, the coal seam would be about 50m below the surface, so a drive doesn’t make sense here. I’ve always thought that it was just a little lean-to on the side of the main shed. I should also point out that there are still plenty of pushbike tracks in this area – I don’t know how long ago Robert used to ride pushbikes there, but I am pleased to see that plenty of people still do the same. 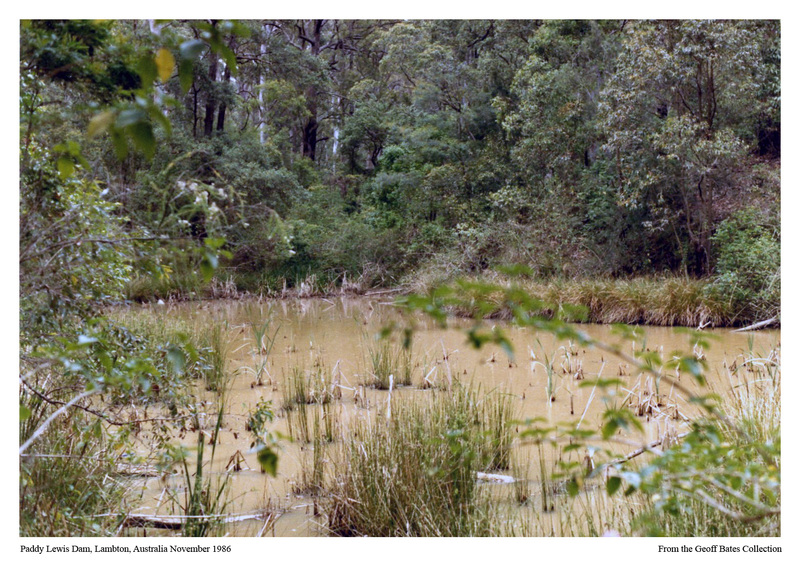 As a youngster in the early to mid 1970’s my brother and I used to catch crawchies (yabbies) in the dam. I also rode motorcycles in the area until 1980 and do recall the dam having no water and parts of it covered in moss at least once. The shaft you mention looks to the south east on the map. There was also a large “hole” directly north quite close to the old skyline drive in road. It was big enough to allow motorcylces to ride inside it like the wall of death you saw at the show decades ago. That was about mid 1970’s. Assuming it’s the same dam we used to fish, that area was known as the skyline and many motorcycles would be there on a Sunday. Admin note: some comments originally posted to this page have been moved to the “Hollywood” article page, as that is now a better context for those comments. During the mid to late 1960’s (primary school age) we would go and visit an old mine site in the Jesmond bush and near the old Skyline Drivein. The mine was known and spoken by us as “the fossil mine”. We went there fairly regularly to obtain fossils of old leaves and insects etc. To obtain the fossils we would enter the opening of the shaft and walk inside for a distance of about 40 metres and the shaft ended not much further along. This actual shaft sloped gently downwards. 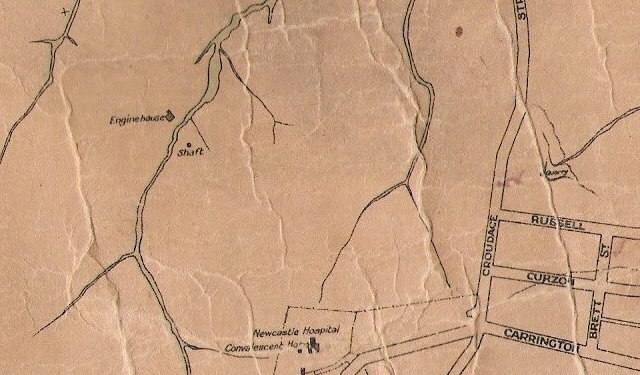 To get to the “fossil mine” we would follow a main dirt track that started at Jesmond oval and walk in the direction of the (now) John Hunter Hospital. This track may relate to the newer bike track at present. After walking some distance along this track we would then divert left through the bush until we came to a gully which ran along behind the Skyline Drivein. Upon reaching this gully we would then walk along the gully one again in the direction of the J H Hospital. 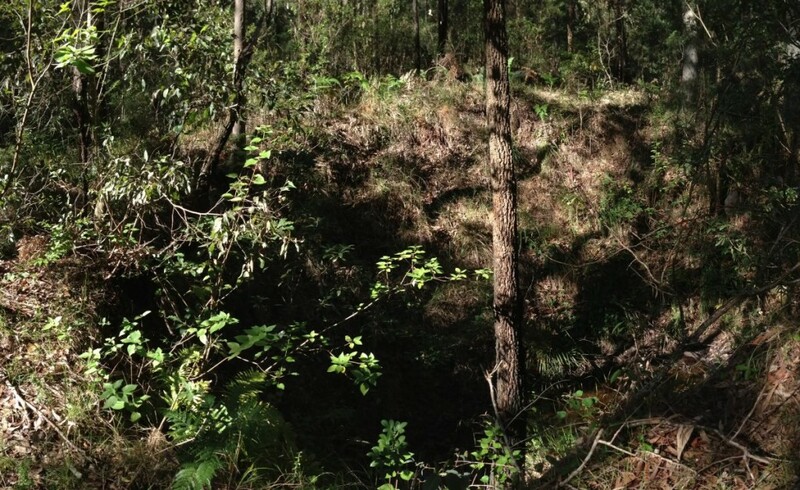 This gully would lead to the opening of the so called “fossil mine”. Thanks. Based on Gary’s directions, I went exploring in the Jesmond Bushland and believe I have found the remains of tunnel, all collapsed in now. I remember the “fossil mine” also The main entrance to it was leveled when the bridge and cycleway was built. I was never sure whether the tunnel was man made or the result of water flow. Dark Creek? The bridge that goes over the watercourse is on the southern side of where the fossil mine entrance was. We even called the track alongside it that is now the cycleway the fossil mine track. Found your page through a post on Facebook lost Newcastle. Grew up in New Lambton /Lambton /Cambridge Hills Estate /rankin park. Last time i believe i was at this dam was about 1982-3 had a small 4wd and loved driving around old mining sites around Newcastle having walked and played as a kid in the late 70s.